Captured in Thailand as a calf, Sissy first appeared in the United States on exhibit at Six Flags Over Texas amusement park in 1969. 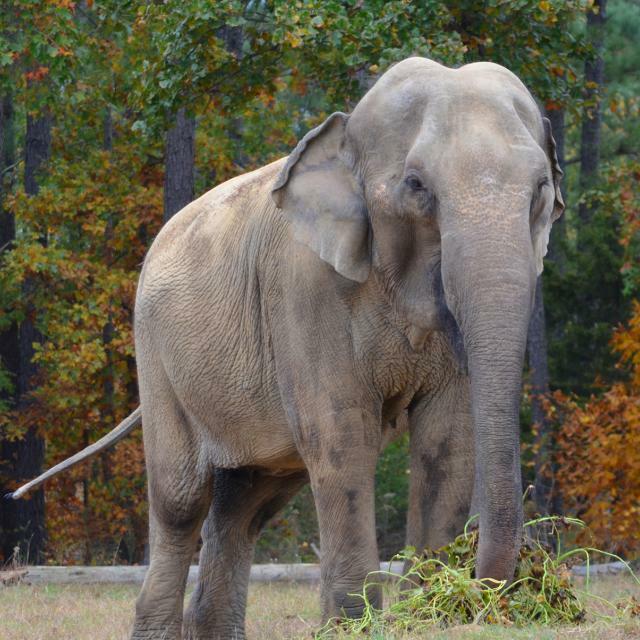 By year’s end, Sissy was sold to the Frank Buck Zoo in Gainesville, TX to replace the zoo’s recently deceased elephant, Gerry. Renamed “Gerry II,” Sissy spent the next three decades as the focal point of the zoo. She famously survived being submerged underwater during a record flood, with only her trunk above water allowing her to breathe. Sissy was eventually moved to the Houston Zoo and later the El Paso Zoo. Sissy’s harsh treatment at the hands of her keepers was videotaped and leaked to the local press. The El Paso community spoke out, and the decision was made for Sissy to be retired to The Elephant Sanctuary. Sissy arrived on January 26, 2000. Reserved and cautious at first, Sissy soon began to venture farther out into the habitat, socializing with the other elephants in Asia Habitat. After several weeks, Sissy was observed lying down in the habitat – incredible news, given that Sissy’s previous keepers had not seen her lying down on her own in years. A few months later, Winkie arrived, and the two became fast friends. Both elephants came to The Sanctuary with a reputation of being anti-social and unable to get along well with other elephants, but they seemed to be a perfect fit for one another—spending nearly all their time together exploring the Asia Habitat. Winkie passed away in May 2017, and in July 2017, Sissy moved to Q Habitat. In stark contrast to the elephant who was reported to show signs of anxiety and fear around water following her flood experience in Texas, Care Staff frequently observe Sissy splashing and swimming in the ponds, even in the rain. Sissy does not have full use and range of motion of her trunk, which records indicate may be due to a dental procedure earlier in her life. 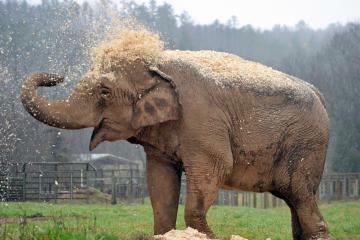 Even with her partially paralyzed trunk, Sissy is able to feed and water herself. She uses the tip of her trunk to throw a hose up to her mouth and to crimp the hose to stop water flow if she is not quite ready to drink. Sissy has the unique communication style of flipping the end of her trunk back and forth to make a “popping” sound. These “pops” are commonly heard when she is socializing or when there is some new enrichment device to interact with. Sissy is also recognizable by her long body, the rippling flap across the top of her ears, and the “freckled” effect on her face and ears. She is most often found exploring the “2nd Pipeline” area of the habitat or napping in the direct sun in “South Yard."